A flat in Loughborough has been served with a closure order after reports of drug-related anti-social behaviour. Charnwood Borough Council secured the order on the council flat in Waterside Close on March 13 and it means no-one, including the tenant, can enter the premises for a period of three months. The orders aim to protect residents by stopping anti-social behaviour which has been taking place in or around a property. It comes after the Council received reports of drug taking at the property and upon investigation found significant evidence of drug use at the flat. Council officers worked with Leicestershire Police to gather evidence which enabled the Council to obtain the closure order at Leicester Magistrates’ Court. Tenants are responsible for both their own behaviour and the behaviour of visitors to the property. If serious nuisance is caused to other residents, closure orders can be used to prevent people entering the premises and stop the anti-social behaviour. If anyone breaches the order and enters the premises, they can be fined or face a prison sentence, depending upon the circumstances. Cllr Paul Mercer, the Council’s lead member for housing said: “We have a duty of care to our residents and have a responsibility to protect them from anti-social behaviour in their community. 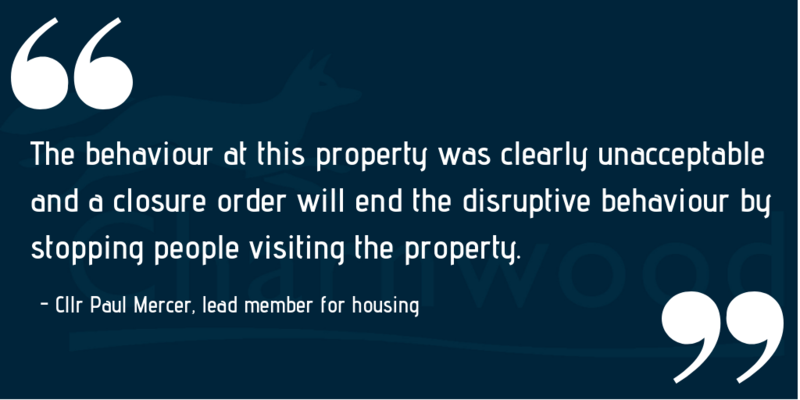 The behaviour at this property was clearly unacceptable and a closure order will end the disruptive behaviour by stopping people visiting the property. If anyone has any concerns about anti-social behaviour, then they can contact the council on 01509 634666. All calls are treated in the strictest of confidence and if people have any concerns about anti-social behaviour then please give the team a call.